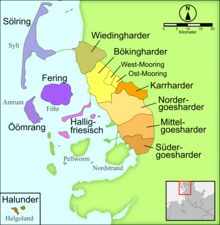 Mooring or Bökingharde Frisian (Böökinghiirder frasch) is a dialect of the North Frisian language spoken in Niebüll and the amt of Bökingharde in the German region of North Frisia. The name Mooring refers to the Risum Bog (Risem Moor or Risem Måår). The dialect forms part of the mainland group of North Frisian dialects. Mooring is often used as a North Frisian lingua franca, especially on the internet, and there is a Mooring Frisian primary school in Risum-Lindholm. e ɛ, ə Schwa when unstressed. ^ Hammarström, Harald; Forkel, Robert; Haspelmath, Martin, eds. (2017). "Bökingharde". Glottolog 3.0. Jena, Germany: Max Planck Institute for the Science of Human History. ^ "b" (PDF). The Linguasphere Register. p. 142. Retrieved 1 March 2013. ^ "Boekingharde" (in German). Nordfriisk Instituut. Retrieved 2 September 2012. This page was last edited on 2 April 2019, at 22:42 (UTC).